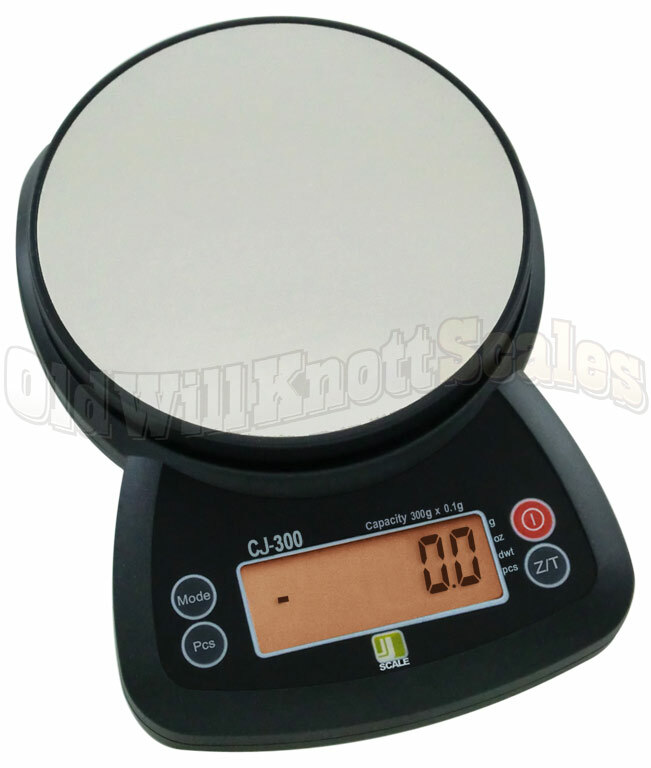 Scale Size 8.0" x 5.6" x 1.5"
Useful Weighing Bowl The CJ300 includes a weighing bowl for all those tough weighing jobs that require a container. The bowl holds approximately 750 milliliters, and is 8.4 inches by 6 inches. This bowl can also double as a dust cover for the scale when it's not in use. Auto-Off Feature If ya have ever had the batteries in something run out because you forgot to turn it off, you'll realize what a blessing this feature is. The CJ-300 will automatically turn off after a few moments of inactivity. Bright Backlit Display This table top scale has a fancy backlit display to help ya see your weight readings, even in dim lighting. Not only that! This digital scale's display will tell ya if ya pressed the tare button, and the unit you're weighing with. Does This Thing Count? You bet it does! All ya need to do is weigh a sample amount of pieces, so the scale can know how much each piece weighs, then start counting. You'll be finished in no time. Tare Feature The tare button on the front of this diet scale can be pressed to "zero out" the weight on the scale. You can then add more weight, and the display will only show the weight of the item you're adding. This sure is useful when ya want to get the weight of each ingredient for that delicious recipe. 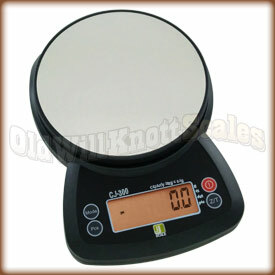 Stainless Steel Platform This compact digital scale has a durable stainless steel weighing platform to make cleanup a breeze. Unlike gold or silver, stainless steel doesn't scratch easily and keeps its shine without rusting or tarnishing. It Remembers The Last Unit Ya Used If your application needs weights in the same unit of measurement, (like ounces for instance), it can be a real pain if your scale always turns on ready to weigh in grams. The CJ300 turns on displaying the same unit of measurement you were using when ya turned it off. Easy Calibration This scale comes factory calibrated and ready to use. Just in case ya need to calibrate it, the CJ300 comes with easy to follow calibration instructions. You'll just need to pick up a 300 gram calibration weight to get the job done. Kill Those Vibrations With VibraKill® Did ya know that vibrations can cause a scale's reading to bounce around from one weight to another? Included with this digital scale is a VibraKill® Pad to keep vibrations, (caused by everyday items like, your fridge, nearby music, your washing machine, etc...) from messing up your weighing. 20 YEAR MANUFACTURER'S WARRANTY! If ya have a problem with this scale, just send it to Jennings' warranty center in Phoenix, Arizona. They'll fix or replace your scale and send it on its way back to ya within a week of receiving it. You should expect your replacement to arrive in about two to three weeks from the day you send the original off. 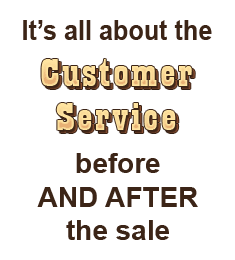 Keep in mind that sometimes Jennings runs out of stock, which can cause a delay in the warranty replacement process. This compact scale accurate, weighs to the precision needed and the price was right. Excellent service, too! Ordered over the weekend and had the scale in my hands on Wednesday. I am very pleased with the scale. It arrived very quickly and is very accurate. Thanks ! We weigh resins and catalysts on this scale. It has a choice of grams and ounces. It is a nice small scale that is very inexpensive. Accuracy seems to be right on. Easy read and very stable numbers on display unlike some scales that bounce back and forth between numbers. I am just so tickled with my scale!..It was just what I was looking for. It is a very precise scale and the bowl is an added plus. Thank you for the way to do business with you. I bought this scale in 2009 to mix epoxy in equal ratios and it has worked like a champ all these years. Item is great, easy start -up. Very accurate. Thank you! Great people to work with! If you need a scale this is the place to buy one! I love this scale and didn't have to pay a lot of money for it. It does everything I need it too! Great scale! This is a great scale. It's well made, accurate, and versatile. I needed a scale that not only weighs, but is capable of counting pieces. This scale does it, and does it well. I also bought the A/C adapter to complete the package. Everything was packaged nicely and arrived quickly. Thank you for the smooth transaction. Received this item promptly and well packed. Great product at a great price! I cant say enough about Old Will Knott. Saw this same exact scale at a local "shop" for 89.99... i liked it, but for the price I thought i could do better. A quick Google search turned up Ol Will's site. Stellar. Cheap Money, fair shipping and the EXACT scale I wanted for 1/3 the price. Be sure to let it "sit" and warm up before use. I did not and found it would lose zero easily... now after being in the house for a few days... perfect. Great hopper, love how it floats on the scale. Doubles as a solid cover when the unit is not in use. The back-light screen turns itself on and off... off when the scale is resting at Zero, but then on again as soon as you add material to the hopper. Screen is easy to see, even when you've packed as much on the scale as you can. I really cant find anything about the scale or the transaction that I would consider to be bad. Buyers, buy with confidence. OldWillKnott will take good care of you, and the Jennings CJ-300 will not disappoint. I could not of been happier with the serivice I received from OldWillKnottScales. It was the best!! And the Jennings CJ300 was exactly what I wanted. It has all the features I need without too many that I don't need and it works like a charm. Overall an excellent experience and I would highly recommend this scale and OldWillKnottScales to anyone! I came here on recommendation from coffee forums because I wanted a 0.1 gm scale to measure espresso. The scale is exactly as represented. Delivery just before Christmas was fast. I had a question on recalibration, called, and was picked up on the first ring. The advice was immediate from the person who picked up. I could not be happier.